Crisis City is a stage in Sonic the Hedgehog (2006) & Sonic Generations for the Xbox 360 and PlayStation 3. As with other levels in the game, it features in all three of Sonic, Shadow, and Silver's stories, although the characters fight their way through the area at different times and for different reasons. Home of Silver the Hedgehog, and at least some-time residence of Blaze the Cat and Mephiles the Dark, Crisis City is set more than 200 years into the future of the game's main storyline. The place is an incinerated ruin, poster child for why a world dominated by Iblis and its monsters is not a pleasant place to live in. Burnt-out shells of skyscrapers rise above an unquenchable sea of living flame, and the warped husks of roadways curl back on themselves in loop-the-loops. Immense fire-twisters scour the wreckage, hurling vehicle husks and building fragments around as though they were leaves on the wind. Essentially, it's hell on earth. While the region's origin is never explicitly stated in-game, Crisis City is presumed to represent the fate of Soleanna New City after the Day of Disaster, considering the superficial similarities between the building types, and Crisis City's proximity to the remains of White Acropolis. After the paradox-generating destruction of Solaris (and consequently Iblis) at the end of the game, Crisis City is presumably erased from the timeline. Nevertheless, Chaotic Inferno Zone, a world reduced to ashes by the Ifrit in Sonic Rivals 2, bears suspicious similarities to this area. The area is also resurrected for play in the time-splicing shenanigans of Sonic Generations. Mission: Hurry to Iblis, the Flames of Disaster! Crisis City is the first level for Silver. During an opening cutscene, where Silver explains how he's been fighting against the flames his whole life, Blaze the Cat appears with news that Iblis itself has manifested in another part of the city. The stage sees Silver and Blaze racing across the shattered urban landscape to confront their first boss, Iblis Phase 1. After the battle, Silver and Blaze are recruited by Mephiles, who sends them back in time to assassinate the Iblis Trigger. Silver's story is the only one with a section controlling the secondary character (Blaze), who during Silver's sections simply follows him around à la Tails in Sonic 2. Sonic, Tails, and Knuckles enter Crisis City via Eggman's time machine in White Acropolis. Conveniently, they encounter Shadow and Rouge in the burnt-out future, with the black hedgehog explaining that in order to return to their own time they'll require some particularly powerful Chaos Control. As such, Team Sonic and (two thirds of) Team Dark split up to search for any Chaos Emeralds in the vicinity. Sonic's squad, however, finds Mephiles' databases instead, revealing information about Princess Elise's fate in this timeline. Sonic starts the level as he did City Escape in Sonic Adventure 2: road-surfing, along shattered concourses and down the flanks of collapsed buildings. The second section is standard platforming; next, the hedgehog has to navigate through the inside of a horizontal flame-cyclone, and brave a Mach Speed section where another of Iblis' twisters hurls cars at him! This final section is much-loathed by players attempting an S-rank, as the difficult-to-avoid obstacles have a habit of removing all Sonic's rings mere seconds before the goal. Shadow and Rouge made their way to the future via Mephiles' time manipulation, only finding Sonic and pals after a great deal of wandering through ruined buildings. The Ultimate Lifeform explores Crisis City for the same reason as his blue counterpart, except that Shadow is actually successful and recovers the green Chaos Emerald. As Rouge gloats over the gem, they also stumble across the dust-covered chassis of E-123 Omega. While the robot is still technically "alive", Shadow discovers that he's in standby mode and thus un-salvageable by external input. 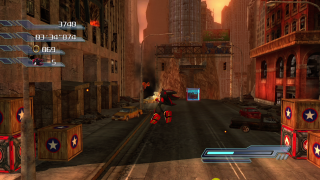 Shadow's gameplay in Crisis City provides various opportunities to use the GUN buggy, and a hang glider section takes him through the same horizontal cyclone as Sonic. An unused voice file in the game shows that Shadow was to take over Sonic in a certain section of the level. There were also some promotional images which showed some unknown parts of the final stage This is unknown, however.